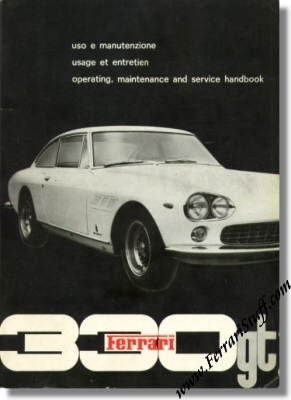 Ferrari 330 GT Owners Manual. This Ferrari owners manual contains 113 Pages describing the owning, driving and (simple) maintenance of this Ferrari. No Ferrari Print Number but issued in 1965 for the 4 headlights version with 5 speed gearbox. This manual is actually the 1964 version for the 4-speed + overdrive but contains a 1965 section in the front with the "modifications introduced in respect to the 1964 - 330 / GT". In near mint condition and appears to be unused.